L Head V-12 Cylinder Engine. Semi-unitary Body Construction and Ultra-streamlined Appearance. 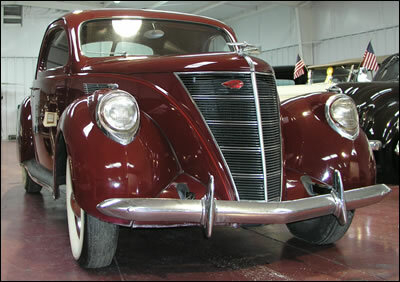 The word teardrop was applicable to the overall sculptured form of the Lincoln V-12 Zephyr Coupe. The sloping rear deck, curved side window corners, simple grille with horizontal bars, in combination with headlights fully molded into the front fenders, all were successfully coordinated in an appearance that gave life to the expression “streamlined”. Only 5,199 coupes were produced in 1937. They sold new for $1,165. The few that have survived make this Model A valuable and much sought after collector car.